"Do everything in a spirit of holy love and you will not find your hands empty at journey's end." Above, new computers purchased from a donation from the Delany Foundation at St Patrick's, Kobongo. I am happy to say that the 200 broilers we bought two weeks ago, none has died. The management is well done. We are also selling indegious eggs. We have one student selected to fund from the sales revenue.He is a very needy case. The first beneficiary of the project. We are in line with the objective of the poultry project. Keep on praying for us. Following are some photos of the project. Many thanks. "On behalf of the Bishop Delany Memorial School, I send my sincere thanks for the support we received from the Delany Foundation. The parents are very happy with the support. 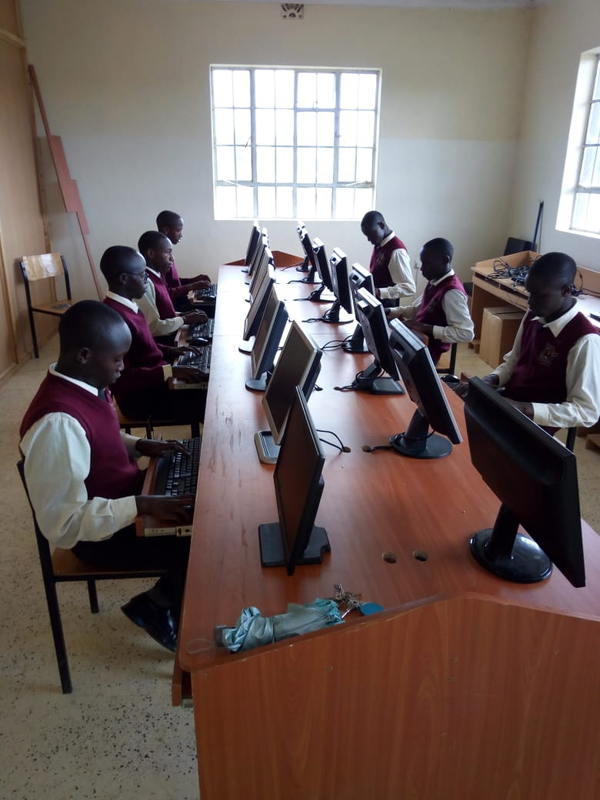 The students' esteem, comfort and learning have all improved since we equipped six classrooms new desks, chairs and lockers with the funds received. This has been a welcome boost to our school." "As a family of the Patricians and the Kwetu Home of Peace, a Youth Charitable Institution, we are grateful for the support that the Delany Foundation has given to the step-up project in which the Brothers are involved. It is pleasing for all of us to hear the appreciation of those influenced by the Delany Foundation gratitude." "On behalf of all here at Delany Academy and the Indian Patrician Brothers working in Ghana, we wish to express our heartfelt gratitude for your help in financing the extension of our pre-school block. This assistance for us is a warm and bright ray of light, reflecting good and caring people attentive to the plight of those in need. Being that our needs are many, this aid helps us greatly." "Marist Youth Care wishes to thank the Delany Foundation for its ongoing financial support which contributes to the funding of a Volunteers' Coordinator. This is an important role within the organisation. At present Marist Youth Care has 78 active volunteers working alongside staff in a variety of roles across the organisation. These voluntary members of staff bring with them a wide range of skills and diversity and include people from professional, trade and domestic backgrounds. Our deepest thanks to the Delany Foundation for their ongoing donation as a contribution to Marist Youth Care's work with very vulnerable children, young people and their families." Interested in volunteering with Marist Youth Care? Please call 02 9672 9200. A thank you to all those who have helped over the years to raise money for the Foundation. The Delany Foundation supports the Marist Youth Care Programme.